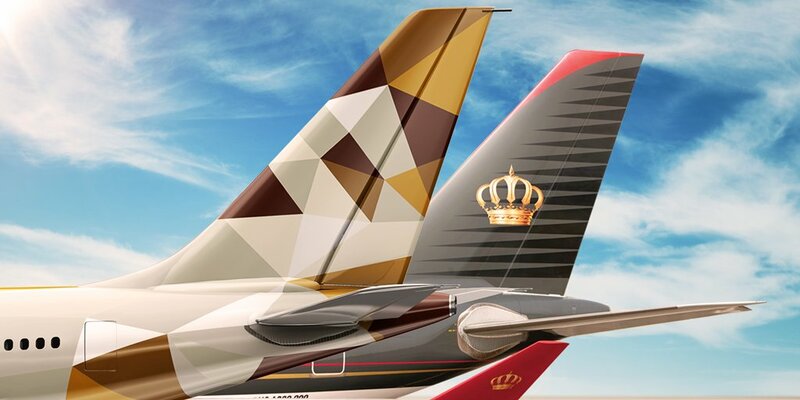 Etihad Airways and Jordanian flag carrier, Royal Jordanian have announced a new codeshare partnership between their respective hubs and destinations in North Africa, Europe, Canada, Asia and Australia. The codeshare flights are open for sale since 7 February 2019, with the first travel date from 15 February. As Etihad Airways continues to fight on after losing plenty of money in questionable investments over the last years that included money burners Air Berlin and Alitalia, they now seek strategic partners to continue being attractive for customers. Etihad published a press release this week announcing the new codeshare agreement. … The partnership will see Etihad Airways place its ‘EY’ code on Royal Jordanian’s flights from Abu Dhabi via Amman’s Queen Alia International Airport to Larnaca and Berlin, while Algiers, Tunis, Vienna and Montreal will be added to the agreement soon. Stefan Pichler is by the way the failed CEO of the failed airline, Air Berlin. I wasn’t even aware that he went to the Middle East after his stint at AB. He did work for Fiji Airways before that. Etihad had a couple tough years, thinning out schedule and employees as they undergo restructuring of the company. Codeshares might be beneficial to them as it allows EY customers to still reach certain destinations even if not on EY metal. They are still a big airline though and could generate decent money for Royal Jordanian if the connections are well received by the passengers. Passengers shouldn’t expect anything special on RJ. They often operate narrow body aircrafts on flights to Europe and even on their long haul planes comfort and good service isn’t really one of their trademarks. I sometimes take RJ from Kuala Lumpur to Bangkok because they’re the last flight out. Their flight also NEVER posts properly (read: at all) to my frequent flyer accounts no matter if I pick BA or AA.